D9 Cakery at Hilton introduces the enhanced D9 Saturday High Tea Buffet for those who fancy cakes and eat a lot of it. Located a 10-minute walk from Orchard MRT, it is hard to miss D9 once you are at the Hilton’s lobby. The six-metre long dessert showcase hits you like a luxurious jewellery display – you just can’t stop ogling the content. Thankfully, you can slide out the glass drawer and have a piece of that artisanal cake handcrafted by Executive Pastry Chef Cindy Khoo. There is an atmosphere of hygge-like casualness once you step inside. Neutral colours, comfy furnishings and a simple aesthetic evoke the calm of Scandinavian interiors in this uber-cosy restaurant. The many seating options with sensual curves are zoned with suitable lighting to set you in the mood for guilty pleasure. The all-encompassing sense of comfort seems to work into the cakes as well. The Velvet Sakura (pictured above) immediately catches my attention with its luminous red pearl and glittering gold. Delicately sweet and undeniably creamy, the cake has a texture that is soft and moist yet not too cheesy. The raspberries ones come with a few flakes of gold foil, befitting the unashamed high tea taitais to fork it down stylishly. Opalys White Chocolate with Pecan is something I would go for a second helping. The cloud of white chocolate has a velvety texture and a rich aroma of fresh vanilla, which works harmoniously with the earthy pecans underneath. There’s also a nice contrast of textures from the smooth white chocolate to the crunchy pecans. There’s no need to fly to Paris to enjoy good Macarons. These homemade yummies are displayed on triangular-shaped serving trays juxtaposed geometrically for an arresting visual appeal. The macarons’ shell is smooth and cakey, and its filling tastes of delicious fruit jams. I had the blueberry and raspberry ones and both taste fruity and sweet. Suggestion: label the flavours rather than letting us do the guesswork, though it’s actually quite fun to do so like Every Flavour Beans. The unusual plating extends to the Premium Chocolate Pralines as well, running with varying heights like Singapore expressways. As a chocolate lover, this was a feast for my eyes, although I was absolutely clueless what I was picking because there were no labels. The Nescafe capsule-shaped one is bursting with smooth rich creamy chocolate which, like fleeting happiness, melts too quickly in my mouth. 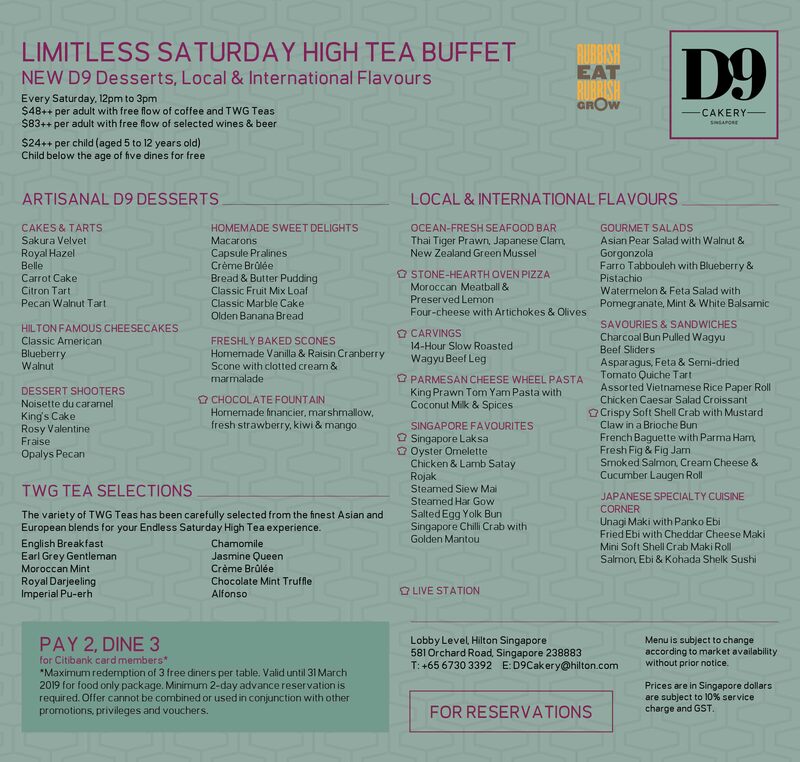 The enhanced D9 Saturday High Tea Buffet means that the buffet line-up also includes over 30 choices of international and local savoury dishes, not just limited to the six-meter dessert showcase. The boat of Oyster Omelette, though palatable, is too conventional and rather bland. Absolutely enjoyed the Chicken Caesar Salad Croissant (pictured above) though. The croissant possesses a fresh buttery taste with a whiff of French bakery. Enclosed inside is a slice of roasted chicken and crunchy lettuce which makes this sandwich seemingly healthy. Terrifyingly simple to chomp down and I am afraid I had it too many servings of it. ‘That’s a really good cut’, my friend repeated twice while ogling my two slices of Wagyu Beef Leg. No way was I sharing because they were really quite good. The 14-hour slow roasted protein has a meaty oomph, coupled with the red wine jus to go even deeper in flavour. Though not melt-in-the-mouth, the meat can be easily torn apart by efficient choppers. –Patisserie Platine by Waku Ghin, Marina Bay Sands: Best Cakes in Singapore? –Regent High Tea, Orchard: My Friends are Taitais! Written by Alexius Chua. Alexius cannot live without his fix of morning coffee. When he is not daydreaming, he visits cafés, pats dogs, and watches movies. An eager traveler, he cannot wait for the next adventure, and aims to lead a happy and meaningful life.